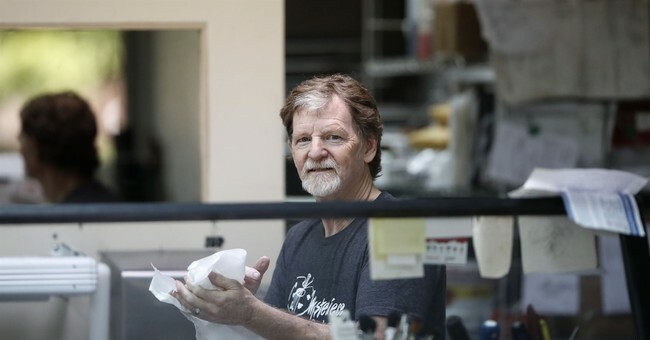 Jack Phillips, a cake artist and owner of Masterpiece Cakeshop in Colorado, is a man of quiet courage, conviction and compassion. Though he’s been demonized by LGBT activists, including the ACLU (which is representing plaintiffs Charlie Craig and Dave Mullins), he has always served everyone. He simply doesn’t participate in or create for every event. Like many creatives, he doesn’t use his artistry for every occasion. He doesn’t make Halloween cakes. He doesn’t create anything with anti-American or "adult" themes. He doesn’t make divorce cakes. And he doesn’t use his artistic expression to celebrate a form of “marriage” that violates his faith. As a creative professional, myself, I can’t imagine the government--whether local, state or federal--forcing me to use my artistic talents for something I don’t believe in. I used to be a Creative Director, and I know first-hand that ad agencies reject clients all the time based on ideological factors. Public relations firms do it all the time. Event planning companies do, too. But somehow, when a Christian wants to act on his/her religious worldview, they can’t withhold their artistic talent without severe governmental punishment? Why is a secular rejection of service more legitimate than a religious one? And we’re not talking about some meaningless party here. We’re talking about the most important institution in any society—marriage. Sure, the Supreme Court decided to magically conjur up non-existent rights and instantly redefined marriage in Obergefell v. Hodges, but it doesn’t change the reality that (co-opted) rainbow colors don’t trump the Constitution. Supreme Court judges have been supremely wrong many many many times before, by the way (Dred Scott v. Sandford, Minor v. Happersett, Korematsu v. United States, Roe v. Wade, Doe v. Bolton and the list goes on). I'm just glad that seven of them got most of the Masterpiece Cakeshop case right. The Radiance Foundation was honored to host the December 5, 2017 #JusticeForJack rally at the Supreme Court. Freedom for Jack is freedom for all. We know this isn’t about “discrimination”. It’s about celebration. This victory is a license to celebrate the Bill of Rights. It’s a license to celebrate free speech and religious liberty which should never be trounced by any form of activism. Despite the ACLU’s attempt to compare the LGBT plight to the blood-bought civil rights struggle of black Americans, there is absolutely no comparison. Even one of the commissioners on the CCRC falsely claimed, in arguing to punish Jack Phillips, that “…sexual orientation is a status absolutely like race”. Sorry. Not absolutely. Not even kind of. In fact, The Radiance Foundation discussed this with some African-American civil rights leaders (see our WeGotYourBackJack.com), including Dr. Alveda King, and they all emphatically agree with us: Gay is not the new black. The very first right enumerated in our Constitution is religious freedom. It’s not optional. It’s foundational. The narrow (in scope) Masterpiece Cakeshop ruling does not address numerous other pending cases (here,here, here and here) where Americans have been denied their First Amendment rights in light of LGBT activism. We’re grateful to those courageous individuals and families who have risked so much to fight for their convictions. They understand that loving every human being isn’t the same as loving every human doing. Disagreement doesn’t equal hate. Disagreement equals tolerance. I hope that, with this unexpected and historic 7-2 Masterpiece Cakeshop decision, similar cases will be resolved with fidelity to the ultimate Law that must direct all American jurisprudence—the Constitution. It should be a piece of cake.